We can dwell on the past and be dragged down by it, or we can resolve to learn from it and move on. In my February post I wrote about the value of forgiving others. Now let’s explore the concept of forgiving yourself… not in the sense of forgiving your own sins (only God can do that), but rather letting yourself off the hook when you feel you’ve let others down or haven’t lived up to your own expectations in some manner. I’m prompted to tackle the subject because of an email I received from my friend Amy Hurley in response to the forgiveness post. Amy lives in Columbus, Ohio, and is a senior manager with Salesforce.com, the powerhouse provider of cloud-based marketing services. Amy also is a wife to her husband Rick, a mom to her two sons, secretary of the high school parent-teacher organization and president of the campground on Lake Erie where we live across from each other during the summer. It may sound strange, but the first thought that popped into my head when I read Amy’s email was the striving by the apostle Paul to perfect his faith in Jesus Christ. Paul knew he faced an impossible task, as none of us can attain perfection this side of heaven. In a similar manner, none of us is always going to serve our families, friends or employers as perfectly as we might envision in our mind’s eye. In other words, Paul did not look backward at his failures and shortcomings. Rather, he looked forward as he pressed on toward his goal of following the call of Christ to the best of his ability. And therein, in my view, lies the secret of releasing ourselves from the guilt we may feel over those times when we believe we missed the mark in our service to others. The past is the past, and not even God can change it. We can dwell on the past and be dragged down by it, or we can resolve to learn from it and move on. That’s easier written than done, you say? I suppose. But consider for a moment what you do when you are driving a car. For most of the trip you are looking at the road ahead. You may check the rear view mirror every so often, but if you focused on what’s behind you for much of the time you’d likely crash your vehicle eventually, with harmful and potentially deadly consequences for you and others. 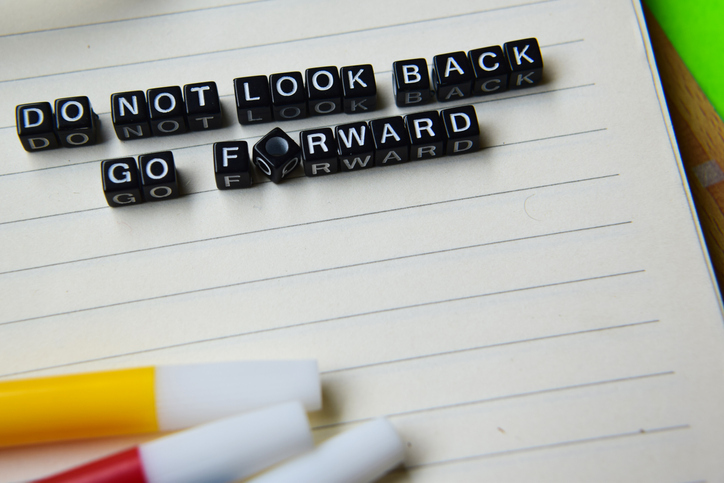 Wouldn’t it be great if we could train our minds to take the same approach we do toward driving and focus our thoughts on how we can better navigate the road ahead rather than continually look back on the regrets of the past? We’d certainly need to forgive ourselves less often. Previous Post In anything you do, always do your best! And aside from the possibility of wrecking our cars if we look in the rearview mirror too much, it’s quite literally not healthy for us to dwell on the past. It only increases the stress in our already-stressed lives, leading to many physical problems.